Nadaka was born in Quebec and learned to play the Guitar at an early age. At 16, he came on a pilgrimage to India and adopted it as his country. He has been living in Auroville since 1974. He has studied a number of traditional music styles, both on Indian stringed instruments and vocal. He has designed and built an acoustic Guitar with scalloped neck and moveable frets which is specially adapted for the subtle tones of Indian music. Working in close collaboration with many famous and outstanding Indian musicians, Nadaka has played an active part in the contemporary movement of Indian music. 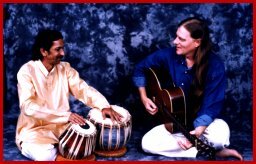 Somnath accompanies Nadaka on the Tabla.